NETWORK FINALS: The rerun AMERICA’S FUNNIEST HOME VIDEOS gained 0.1 in final numbers, and THE $100,000 PYRAMID lost the same. CABLE HIGHLIGHTS: Viacom loves its simulcasts, and Sunday’s was the BET AWARDS, which was at 1.22 on its home network with a 0.62 POST-SHOW and a 0.41 PRE-SHOW (down from last year’s 1.54/0.67/0.43). Simulcasts were as follows: 0.20 on VH1, 0.13 on MTV, 0.09 on TV Land, 0.07 on BET Her, 0.03/95K on Logo, 0.03/78K on MTV2, and zero/8K on MTV Classic. At HBO, WESTWORLD had a Season 2 finale at 0.56, which was down 0.05 from last week, and down a disturbing 0.46 from the December 2016 finale, confirming that while the show is a hit, it’s certainly not the network’s next GAME OF THRONES. The rest of HBO’s night had LAST WEEK TONIGHT down 0.09 to 0.31, and SUCCESSION down 0.03 to 0.15. AMC’s PREACHER returned at 0.23, down two-tenths from the 2017 premiere, and down 0.12 from the finale (both on Mondays). Elsewhere in scripted, Adult Swim’s ROBOT CHICKEN gained 0.04 to 0.51, and MR NEIGHBOR’S HOUSE was at 0.24. TNT’s CLAWS dropped 0.06 to 0.39. FX’s POSE had an impressive 0.08 build to 0.29. Hallmark’s GOOD WITCH rose 0.04 to 0.23. On Showtime, THE AFFAIR ticked up to 0.09, and I’M DYING UP HERE fell 0.03 to 0.02/184K. Unscripted was led by Fox Sports 1’s WORLD CUP match at 0.65, and the afternoon’s NASCAR race was at 0.39. 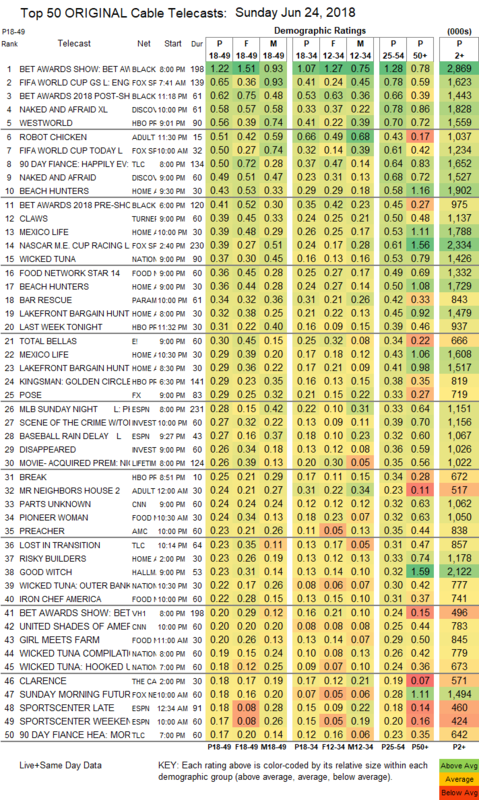 On Discovery, NAKED & AFRAID was at 0.58/0.49, compared to last week’s 0.51/0.44. On TLC, 90 DAY FIANCE gained 0.04 to 0.50, and LOST IN TRANSITION ticked up to 0.23. HGTV’s line-up was led by BEACH HUNTERS at 0.43/0.36, compared to last week’s 0.38/0.34. Nat Geo’s WICKED TUNA climbed 0.07 to 0.37. On Food Network , FOOD NETWORK STAR ticked up to 0.36, and IRON CHEF AMERICA held at 0.22. Paramount’s BAR RESCUE gained 0.03 to 0.34. 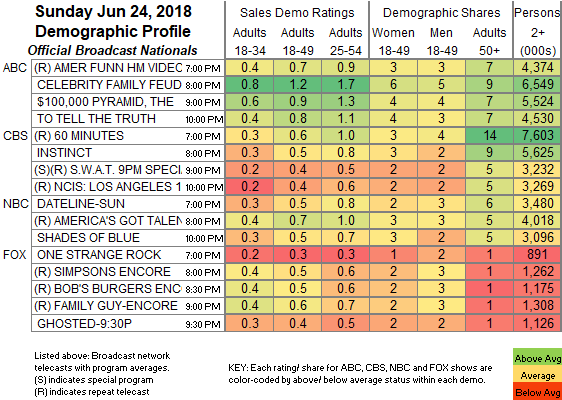 E!’s TOTAL BELLAS dropped 0.05 to 0.30. On ID, SCENE OF THE CRIME edged up 0.02 to 0.27, and DISAPPEARED was steady at 0.26.